Most boats have a diesel-engine for propulsion. 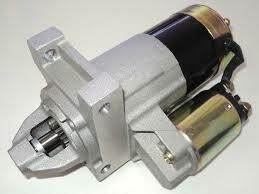 The starter motor is the essential component to turning over and starting a diesel engine. It is a frequently cited along with its associated circuitry as a cause of engine failure. The electrical systems that make up a marine-engine starting system include the starting battery; the engine control panel; the wiring loom; the preheating system and the starter motor. It is important to understand the sequence of electrical functions that occur to start an engine. When the key switch is turned to the on position, the engine control circuit is energized, and when the key switch is turned to the start position the start solenoid is energized and pulls in to supply current to the start motor. The motor turns to bring the marine-engine up to a speed where ignition occurs. An electric starter consists of three main components, which are the DC motor, the solenoid, and the pinion engaging drive. The DC motor must provide the high initial torque required to overcome friction, inertia and cylinder compression and accelerate the engine speed to a point where self-ignition temperatures and combustion starts. This is typically in the range 60-200 rpm depending on whether glow plugs are used. The starter motor torque is transmitted by the pinion and ring gear onto the flywheel. Your marine-engine starter needs you! The solenoid is a high current relay that consists of coil and armature, moving and fixed contacts. In most cases the solenoid is mounted directly to the starting motor housing, which reduces cables and interconnections to a minimum, although on some starters they are completely separate. When the solenoid coil is energized by the starting circuit, the solenoid plunger is drawn into the energized core and this closes the main contacts to supply current to the starter motor. On many starters the solenoid also has a mechanical function. The solenoid activates a shift or engaging lever to slide the overrunning clutch along the shaft to mesh the pinion gear with the flywheel, and when engaged the starter motor then turns the engine, so meshing occurs before starting. Your marine-engine starter needs you! 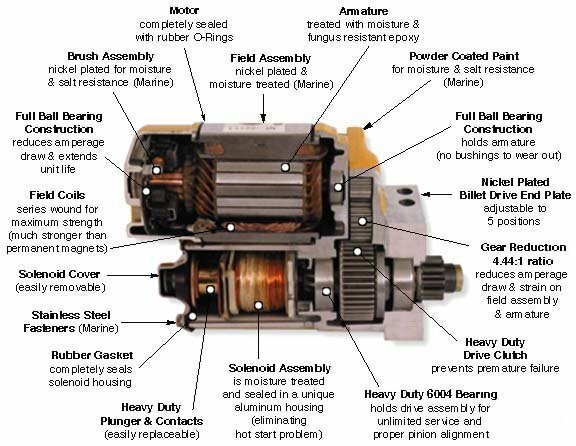 WHAT ARE THE PARTS OF A STARTER MOTOR? The starter motor consists of 4 poles shoes or magnets, and some starters use permanent magnets. The poles are surrounded by the excitation winding which creates the magnetic field when current is applied. The rotating part is called the armature and also incorporates the commutator. The 4 carbon brushes provide the positive and negative power supply via the commutator to the armature windings. DC motor types are based on the connection configuration of the field windings. The field windings are connected either in series or parallel with the armature windings, and this includes the series wound, the shunt (parallel) wound, the compound (series-compound) wound and the permanent magnet. Shunt motors are not used in starters as they have a low starting torque. Series wound motors are used as they have high starting torques, however they can run at high speeds when under light loads. Compound wound starter motors are also used as they have both high starting torques and some speed regulation capability. Your marine-engine starter needs you! The pinion engaging drive is located within the end shield assembly of the starter and consists of the pinion engaging drive and pinion, the overrunning clutch, the engagement lever or linkage and spring. When the motor operates the drive gear meshes with the ring gear or flywheel teeth to turn the engine, and then disengages after starting. The overrunning clutch has two important functions, the first is to transmit the power from the motor to the pinion, and the second which is to stop the starter motor armature from over-speeding and being damaged when the engine starts. Pre-engaged starters generally used a roller type clutch, while larger multi-plate types are used in sliding gear starters. 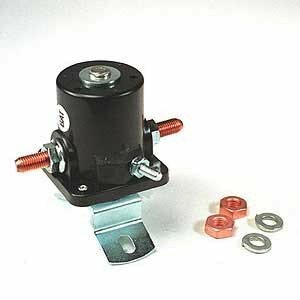 The most common type of starter motor is the solenoid-operated direct drive unit and the operating principles are the same for all solenoid-shifted starter motors. Some manufacturers use a gear reduction starter to provide increased torque. Your marine-engine starter needs you! 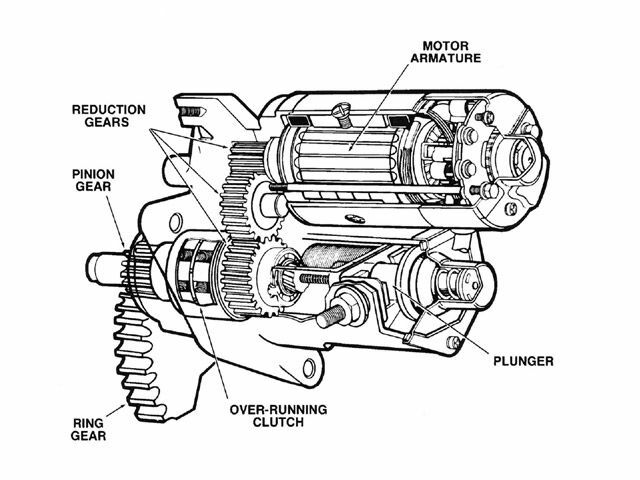 The gear reduction starter differs from most other designs in that the armature does not drive the pinion directly. In this design, the armature drives a small gear that is in constant mesh with a larger gear. Depending on the application, the ratio between these two gears is between 2:1 and 3.5:1. The additional reduction allows for a small motor to turn at higher speeds and produce more torque with less current draw. The solenoid operation is similar to that of the solenoid- shifted direct drive starter in that the solenoid moves the plunger, which engages the starter drive. Sliding gear drives with electrical or mechanical pinion rotation type starters are typified by the Bosch starters. Still seen on many boat engines is the Bendix friction-clutch mechanism drive which was developed in the early 20th century. The starters use a drive friction clutch, which has a drive pinion mounted on a spiral-threaded sleeve. The sleeve rotates within the pinion, and moves the pinion outwards to mesh with the flywheel ring gear, and the impact of this meshing action is absorbed by the friction clutch. The engine once started then turns at a higher speed and drives the Bendix gear at a higher speed than the starter motor. The pinion then rotates in the opposite direction to the spiral shaft and then disengages. Your marine-engine starter needs you! Read PART 2 of this 3 Part Series on the marine diesel engines and improve your systems reliability. Click on this link to read PART 2 and all you need to know. Read PART 3 of this 3 Part Series on the marine diesel engines and improve your systems reliability. Click on this link to read PART 3 and all you need to know.